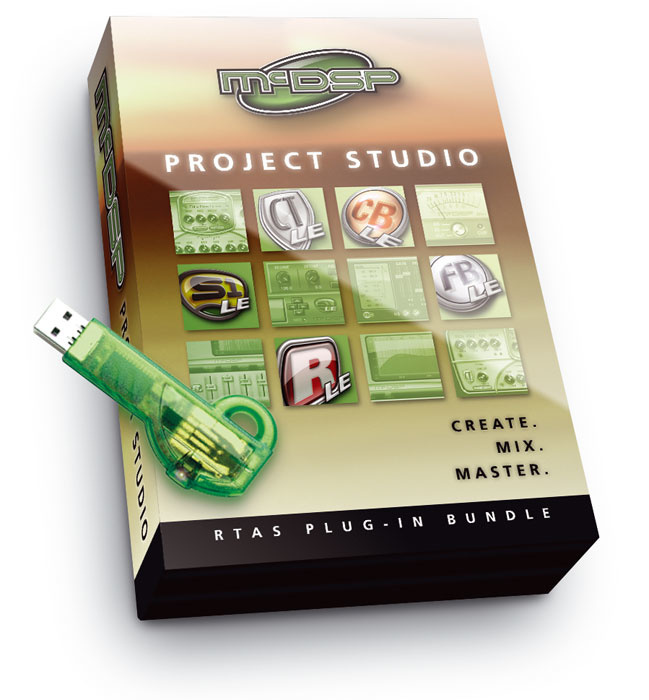 McDSP's Project Studio Bundle provides an affordable way for Pro Tools users to get their hands on versions of all the company's acclaimed effects and processors. 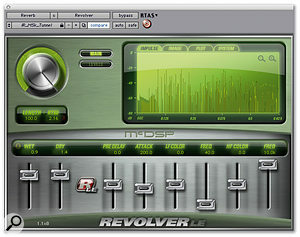 McDSP's original Project Studio Bundle consisted of LE versions of their Chrome Tone, Compressor Bank, Filter Bank, Revolver and Synthesizer One plug-ins, in the Pro Tools-only RTAS native format. They've now updated the bundle, adding LE versions of their new ML4000 mastering limiter and Analog Channel tape machine emulation plug-in, without raising the price, though there is a small charge for original Project Studio Bundle owners to upgrade and get the extra new plug-ins. With the release of this new bundle, McDSP have also discontinued selling the LE version plug-ins individually, so you need to consider the Project Studio Bundle as a complete package, take it or leave it. We have looked at the fully featured versions of most of McDSP's plug-ins in past issues. 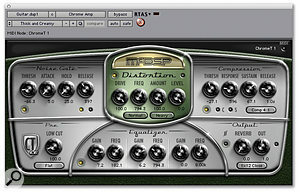 We covered the Classic Pack in the January 2007 issue (www.soundonsound.com/sos/ jan07/articles/mcdsppack.htm), while back in April 2004 we reviewed the Chrome Tone guitar amp emulation plug-in (www.soundonsound.com/sos/ apr04/articles/mcdsp.htm), and in January 2003 we looked at the Synthesizer One analogue synth emulator (www.soundonsound.com/sos/ jan03/articles/mcdspsynthone.asp), so I'm not going to spend too much time going over the same ground again. However, McDSP have trimmed back on the features of each of the plug-ins to create the LE versions featured here, so the key question is whether they are still useful tools. First, let's take a look at the elements from the original Project Studio Bundle. 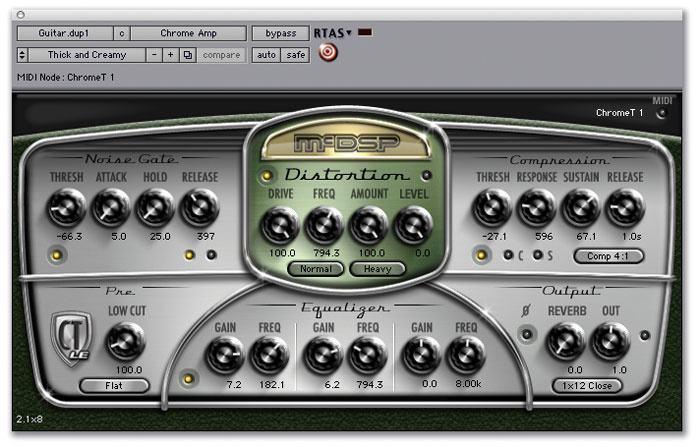 Chrome Tone is McDSP's guitar amp modelling and effects plug-in, and for the LE version they have dropped the additional effects sections such as Chorus, Tremolo and Wah, as well as the Stack option. What you are left with is the core of this plug-in, the amp and speaker modelling section. However, it took me a little while to find it in my plug-in menus. While Line 6's Amp Farm and Waves' Guitar Tool Rack are listed under 'Harmonics', IK's Amplitube is under 'Other', and I eventually found Chrome Tone under 'Modulation', labelled Chrome Amp. It would be great if Digidesign could set a standard for which plug-ins should come under which headings, and have the plug-in manufacturers follow that code. If you want a 'point and shoot' guitar amp simulation plug-in, this probably isn't the one for you. The original offered lots of editable parameters, and the LE version has retained most of them (see screen below). It's the least cut-down of all the plug-ins in this bundle, so if you want a large amount of control over the sound, rather than the ability to dial in instant replicas of well-known amps, it's worthy of serious consideration. 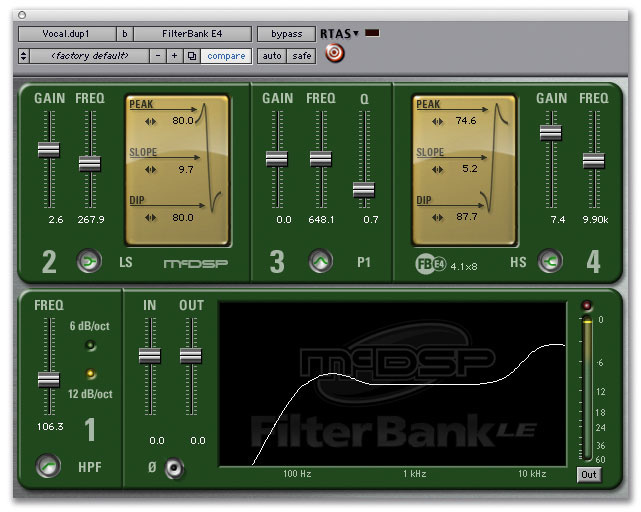 The full version of McDSP's Compressor Bank consists of four separate plug-ins called CB1, 2, 3 and 4. The LE version featured here is just the CB4 element of the full version (see screen above), which, to my mind, is the best bit. CB4 is based around a series of presets that are inspired, like many McDSP plug-ins and settings, by some of the classic processors that have been around over the years. So the LE version of CB4 is able to model hardware compressors such as the Dbx 165, Neve 2254 and Urei 1176N, to name but three. There are lots of very good, cost-effective compressors around, including Waves' C1 and Digidesign's Smack LE, and let's not forget Digidesign's Dynamics III plug-in, which now comes free with all versions of Pro Tools. McDSP have very wisely chosen to retain the 'different' element for the LE version rather than produce yet another budget compressor plug-in, which could easily get lost amongst all the rest. This plug-in definitely brings back memories of the Neve 2254 and the Dbx Over Easy compressors, both of which I have owned over the years, and it is great to have them back in my virtual effects rack. 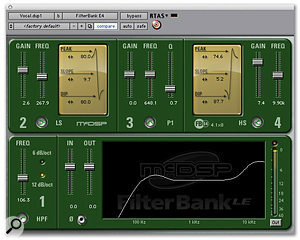 McDSP's Filter Bank, likewise, consists of a number of separate plug-ins with different combinations of EQ bands, and for the LE version (see screenshot below), McDSP have chosen to retain three of them. E4 has a low shelf, high shelf, one parametric band and a high-pass filter, P4 is four parametric EQs and F1 is a low-pass filter. I found only having one parametric section on the E4 plug-in limiting at times and would have preferred McDSP to have included E6 instead. I tend to use a combination of shelving and parametric EQ on most sources, and neither P4 nor E4 provide ideal combinations for that way of working. However, it was nice to find that they have retained the slider or knob interface option in the LE version, together with the feature to change it back by holding down the 'U' and 'I' keys as you select a McDSP plug-in. 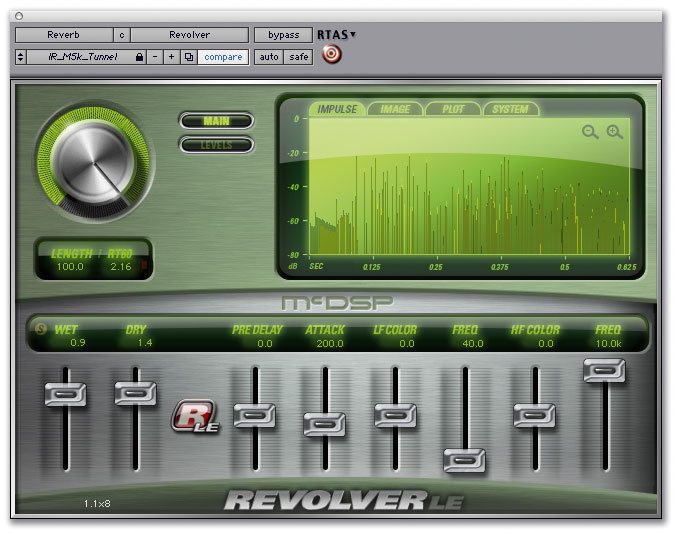 Revolver is one of the few McDSP plug-ins we haven't looked at before. It's a full-blown convolution reverb unit with a very comprehensive set of presets that includes loads of officially licensed impulse responses of TC Electronic's M5000. The full native version has both sweep and IR reader options that enable you to create or import your own presets, but the LE version is basically limited to loading presets, and lacks some of the full version's controls, such as the built-in EQ and delay. However, the range and quality of the presets already available for Revolver make the LE version an incredibly useful reverb plug-in, and one that I will make space for on my already crowded virtual reverb shelf. I found all the presets I tried very useful, and they have covered both 'music' and 'post' applications well with them. Having genuine TC M5000 impulse responses rather than McDSP's usual 'in the style of' presets is the icing on the cake for this plug-in. I also really like the separate Dry and Wet level controls, which replace the usual Mix control that you find on most reverb plug-ins. McDSP accurately describe Synthesizer One LE (below) as a preset player, as they have stripped most of the controls away from the full version. That said, there are still a reasonable amount of tweaks available, which are accessed on five different editing pages: Main, Voice, Filter Envelope, Amp Envelope and Arpeggiator. I would have preferred to have all these pages consolidated into one window, as it is easy to lose track of the different settings when you flick from one page to another. As we said in our original review of the full version of Synthesizer One back in April 2004, this plug-in is a very usable virtual analogue synth, with its strong points being the pad and sci-fi sounds, although the bass and dance-related sounds are decent enough. The two new additions to the Project Studio Bundle are ML4000 LE and Analog Channel LE. 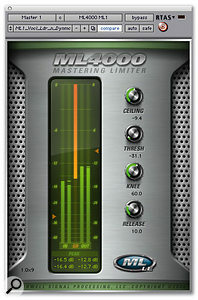 The full version of ML4000 comprises two plug-ins, namely the multi-band ML4 and the single-band ML1 mastering limiters. The LE version (see screenshot on the opposite page) provides the single-band ML1 mastering limiter, but without its Character Mode switch (even though the names of some of the presets imply that you can access this feature by selecting the appropriate preset). It took me a while to work out that this is the case, since there is no LE version documentation included for ML4000 LE. Looking at the ML1 plug-in window, I was surprised to see a Knee control. This isn't something you would normally find on a limiter, but its inclusion helps to make limiting more transparent in some circumstances, and McDSP are to be commended for providing it. To check out ML1, I went back to my Limiter Shootout test Session from May 2006 (www.soundonsound.com/sos/may06/articles/ptworkshop_0506.htm) to see how ML1 would handle the range of test material I had used. Overall, I was very impressed, and as you can see from the Loudness Improvement (Leq) and Sound Quality tables (below), this plug-in compares very favourably with the leading contenders in the single-band category on everything except the drum & bass sample. Again, McDSP's Analog Channel normally consists of multiple plug-ins, but the LE version (above) only includes the AC2 element of the full version. AC2 is a tape-machine emulation plug-in that can reproduce the sound of a variety of classic tape machines. However, McDSP have also removed most of the other adjustment options from the full version, such as tape speed, release time, tape formulation and so on. The only one of these I missed was the Release control, as on the vocal track I tried it with, the release time wasn't right, so I couldn't use it. I then tried it on a bass guitar track, and again, each time I preferred the unprocessed version. Finally, I turned to a Session with some drums in it and dropped AC2 LE into the kick drum track, and at last I found a situation where it added something to the sound. As I have said in these pages before, I spent many an hour lining up analogue tape machines to minimise all the very features this plug-in makes a feature of, so perhaps that colours my attitude to it. Overall, this is an excellent, low-cost bundle from McDSP. 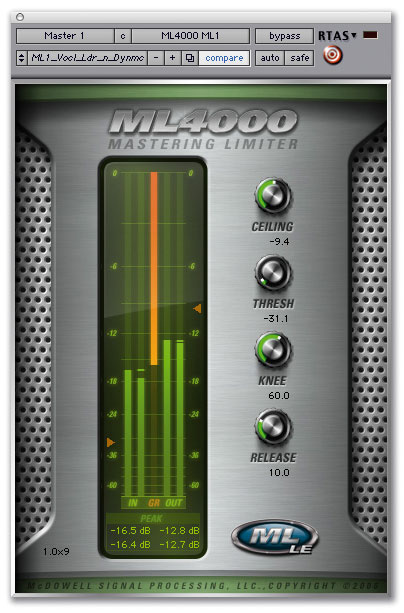 Of the seven plug-ins, two really stand out for me: the ML4000 LE mastering limiter and the Revolver LE convolution reverb. These alone make it worth buying this package. Although the LE versions of all the plug-ins provide cut-down feature sets, in general, they are very useful plug-ins nonetheless, and it's also worth pointing out that all the plug-ins will support settings interchange with the full versions, except for Synthesizer One LE. Another nice touch is that the bundle comes with a pre-programmed iLok in the McDSP corporate colour of green, so you can get to work straight away. On the down side, though, I was disappointed that the supplied documentation was, at best, sketchy, and at worst, in the case of ML4000 LE, non-existent. There aren't really any comparable bundles on the market, especially in this price bracket. The closest is probably the Waves Native Power Pack, but the good thing about the McDSP Project Studio Bundle is that it is made up mainly of plug-ins that are out of the ordinary. The 'plainest' plug-in in the pack is Filter Bank LE, and this is also too heavily cut down from the full version, in my view, but most of the other plug-ins have no obvious counterparts in rival plug-in bundles. Compressor Bank LE emulates a wide range of analogue compressors, Chrome Tone LE is a guitar amp and speaker modelling plug-in, Revolver LE is a convolution reverb rather than the normal algorithm-based reverb plug-in, and the Synthesizer One LE analogue synth emulation is, to my knowledge, a unique element in this sort of plug-in bundle. ML4000 LE gives most of the single-band mastering limiters on the market a good run for their money, even though some of them cost a lot more than this whole bundle, and Analogue Channel LE 's tape-machine emulation is, again, quite unusual. A 'different' set of plug-ins to make up a very useful bundle. ML4000 LE and Revolver LE stand out. Includes a pre-programmed iLok ready to go. Filter Bank LE is too cut down. Original Project Studio Bundle owners have to pay for the upgrade to the new version. The Project Studio Bundle is a well thought-out and good value collection of RTAS plug-ins for Pro Tools that definitely offers something out of the ordinary.